CJ always keeps a big smile on his face! CJ is a very active 3-year-old boy who loves soccer and running around in his Super Mario Brothers’ costumes! His energetic demeanor and ever-present smile have been especially helpful during the past year. CJ was diagnosed with acute megakaryoblastic leukemia in October 2016. He has been receiving treatment since then at St. Jude Children’s Research Hospital, requiring his family to move hours away from their home state. With CJ’s diagnosis came many difficult decisions. Both of CJ’s parents had full-time jobs. They also owned a home. CJ’s mother and father decided that their son’s wellbeing was their top priority and chose to stay by his side throughout his entire journey. This required them to leave their careers and give up their home so they could always be with CJ at the hospital. The family found a great sense of normalcy in their togetherness, but they quickly found themselves stressed by financial troubles and how to afford life after cancer. Their savings were running out. One major barrier was their lack of safe and reliable transportation to and from daily treatment sessions. Without a car, the family relied on a shuttle bus shared by all patients and caregivers at the hospital. Family Reach was able to work with the Anthony Rizzo Family Foundation to keep CJ safe and infection-free by providing a grant that allowed the family to purchase a car. Our partnership with the Rizzo Foundation allowed us to help 156 families like CJ’s in 2017 at 56 different hospitals and cancer centers across 26 states. Of the families helped, 25 percent were single parent households and 61 percent reported that they’ve lost at least 50 percent of their household income since the beginning of treatment. For 68 percent of these families, the assistance from Rizzo allowed them to stay on top of their rent and mortgage payments. This means they were able to keep a roof over their heads and remain in their home during a very critical time in their lives. By providing families fighting cancer with the resources they need to ensure a stable environment during treatment, Anthony Rizzo and his family are giving patients their best shot at overcoming their diagnosis and offering a sense of hope. 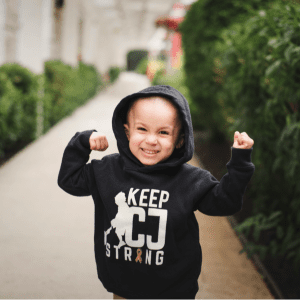 CJ’s latest results show that he is cancer-free! We keep this family in our thoughts as CJ continues to recover.